This quote, from a Radio Lab segment, stuck. It is stuck in my head with the memory of an old friend. His memory is constant. I have no photographs of him so I must keep him in my memory. I lost contact with him in late 1990. His story was always meant to be here, but it is long and painful. 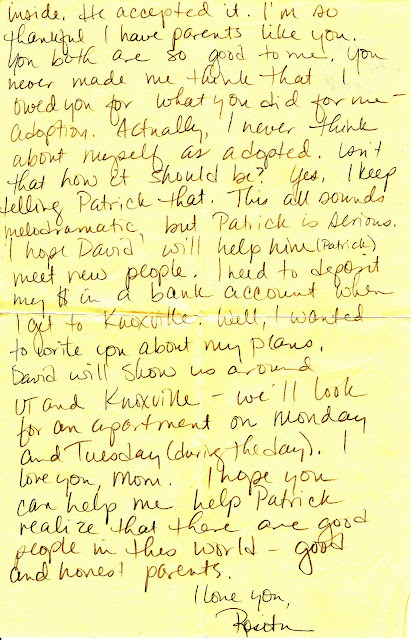 If you are considering adoption, please read the entire story. In early 1990, I met a man while training at Red Lobster in Clarksville, Tennessee, the town where I finished my undergraduate degree. His name was Patrick. He was a handsome blonde with sculpted features, and I was instantly attracted to him. Our first days were the things of awkward teens. One night, I admitted my fear of relationships. Patrick patiently listened to the story of my first love, a soldier at Fort Campbell. While dating me for a year, the GI from Wisconsin revealed that he was engaged to a woman in his hometown of Appleton, and that he planned to marry her. 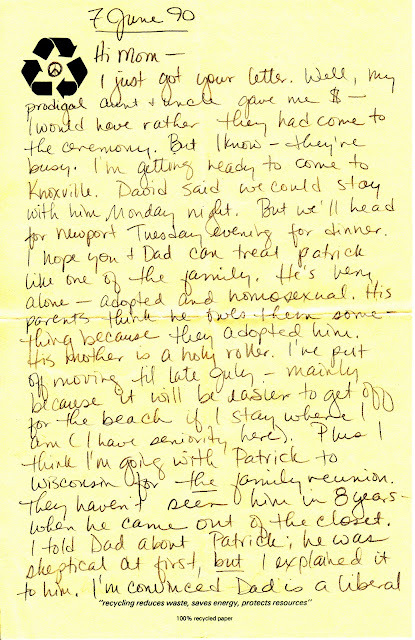 Hearing this, Patrick revealed that he, too, was from Wisconsin and had recently finished his service in the military. He said he had been married and was now divorced. His candor and honesty dispelled my fears, and he won my trust. With mutual trust, Patrick explained that he was gay and that he had been married to a lesbian during his time in the military to mask his true self. His fear was a deep-seated one. He wasn’t always able to be himself. One evening, as I lamented my inevitable move to graduate school and my fear of being alone in Knoxville, Tennessee, Patrick suggested, “I could move with you. It doesn’t matter where I live, and we both could work at the Lob!” We felt our fears of being alone dispel. We made plans, and I wrote the following letter to my mother.